2019 Apple Festivals in North Carolina - Where, When and More to Find an Apple Festival Near You! Looking for a apple festival in North Carolina in 2019? (just scroll down the page)There is no other listing as complete and current as this list, just updated! All the apple festivals in North Carolina we can find are listed on this page! If you love strawberries, look for a festival near you below! And I'm always looking for more apple festivals! Please write me, if you know of any to add! I update the dates as soon as the festivals publish their information, but you can always click on the links (usually the name of the festival) to see the current information on the festival's own website. North Wilkesboro, NC. The Brushy Mountain Apple Festival is one of the largest one-day arts and crafts festivals in the Southeast. The Brushy Mountain Apple Festival is not just this club's largest fundraiser, but has become a one of Wilkes County's biggest fundraisers. Over 100 civic, church and other non-profit organizations participate in the festival. Over 160,000 people visit this festival during the day and it's FREE. 201 E. Meadow Road, Eden, NC 27288. Phone: 336-627-5148. Fax: 336-623-2730. Contact: Janet Lester. Hendersonville , NC. Labor Day weekend!. Ongoing entertainment will be staged in front of the Historic Courthouse on Main Street, beginning at 9:30 or 10 a.m. each day and continuing until 10 p.m. Friday, Saturday and Sunday. Some seating is available, but festivalgoers may want to bring chairs. City: Taylorsville, NC. Phone: 828-632-2999. Email: [email protected]. The streets of Taylorsville fill to overflowing for the Annual Taylorsville Apple Festival which draws an estimated 30,000 attendees and hosts over 250 exhibit booths. The festival provides a fantastic assortment of entertainment, food and vendors. Click here for our Facebook page. They also have an Apple Blossom Festival in the Spring. Historic Mainstreet, Waynesville, NC 28786. Phone: 828-456-3021. Email: [email protected]. Open: October 20 Thursday, 10 am to 5 pm. Open: Click here for current open hours, days and dates. Directions: Click here for a map and directions. Payment: An annual festival celebrating the Fall Harvest Season. During the last 23 years, the Apple Harvest Festival has grown to a premier one-day celebration in the charming historic mountain town of Waynesville. With more than 130 exhibitors and 35,000 people expected, we will gather for a glorious day of color to celebrate the fall harvest. Enjoy a backdrop of the picturesque mountains of Western North Carolina as you celebrate everything apples. Handmade crafts, local food and continuous live entertainment will delight even the most seasoned visitor during this annual celebration. Entertainment will include local mountain music, cloggers and the occasional character! 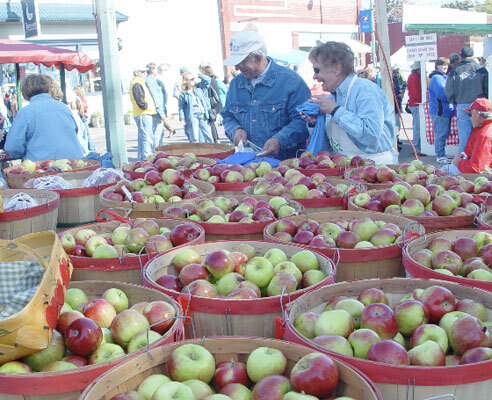 Take home a peck of locally grown apples from the county apple growers association. Haywood County.